← The other side of this record has a similar format with ‘Frank Zappa’. See the bottom of the page for more about these records. 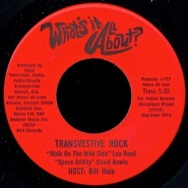 For most of the “Celebration Rock” run, I included in each program a feature called “What’s It All About?” Every couple of weeks, the five minute show was shipped to me and to a few hundred stations around the world via a 45 r.p.m. record, with one WIAA feature on each side. The producer/host was Bill Huie who was the director of TV, Radio, and Audio-Visuals (TRAV) of the southern branch of the Presbyterian Church. Each week, Bill’s program featured one artist or band with several excerpts of their music, plus interviews with the artists that Bill did himself or gathered from other sources (including, on rare occasions, interviews I had done). If the interviews were taped especially for Bill’s show, the artist(s) might well share something of their personal faith or lack of it. But often the interviews were more generic and Bill would have to springboard from some general comment the artist had made, or maybe from a particular song, in order to reach a conclusion about what it was all about that week. I used the WIAA segment near the beginning of each “Celebration Rock” program to help draw the listeners into my own hour-long theme, though usually Bill’s segment didn’t tie directly into mine content-wise. There were weeks when I might be playing cuts from the latest Chicago album, and I could lead in with a WIAA feature on that band. But most of the time, his show was simply a fast-paced, celebrity-oriented addition to my own longer program. Some of the artists were one-hit wonders (though at the time they may not have known that!) and others were rock legends, from the Beatles to the Moody Blues. Interviews were sometimes “phoners,” that is, taped telephone conversations; others were recorded backstage at concerts, or less frequently in closer studio environs. 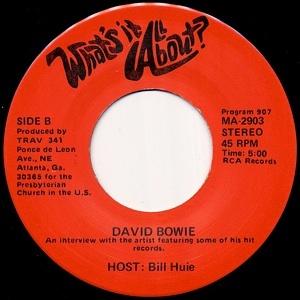 Some interviews were hardly broadcast quality, but Bill added enough music to rescue the less than pristine interviews. As far as I know, ”What’s It All About?” was unique. I know of no other weekly program just like it. Bill Huie was able to find something good, something helpful (not just usable) in every interview, and from his show his listeners always learned something about what it is that holds life together and what holds people together. Grace, faith, harmony, love, and music… for Bill Huie, that was what it was all about. Certainly Bill’s work was a far cry from the current bevy of show biz personality interviewers on so-called reality shows. I doubt they know what it’s all about in a cosmic sense! Bill was a Southerner, and I assume most of his life was lived in Georgia. WIAA was recorded in the TRAV studios at the denomination’s headquarters in Atlanta. I saw the place once, and was amazed at what Bill could do with such a modest budget and very small staff. 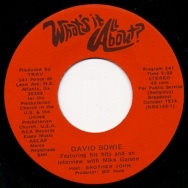 (For many years, Bill produced a WIAA newsletter, printed on bright yellow legal-sized pages, with news of his interviews, comments about pop songs, and news of the media culture.) Bill tried to lure me away from Richmond twice (or as he put it, “always and whenever”), but I liked my freedom, my own show, and I wasn’t interested in becoming enmeshed in denominational politics at the home office. Still, I was flattered. In his youth, Bill Huie had been a child evangelist! How his path led to a Presbyterian seminary and denominational leadership, I don’t know. 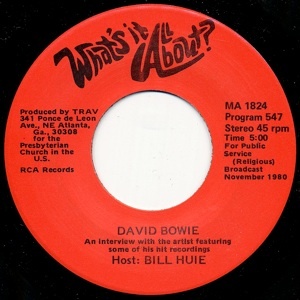 I do know that Bill had made enough connections in the music business over the years to be elected to the board of the National Association of Recording Arts and Sciences, NARAS, the organization that hands out Grammy Awards. 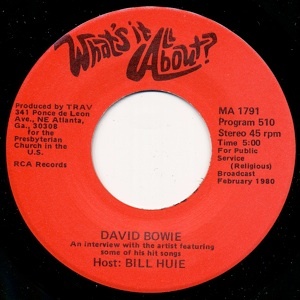 I coveted the experiences Bill had as the annual Grammy ceremony was in the planning stages, and I would loved to have been at the Grammy show even once…and there was Huie’s name in the credits of the Grammy broadcast year after year. Since “Celebration Rock” left the air in the early 1990’s, I held on to all my red-labeled WIAA 45’s. Until we packed up to move last fall. I looked at a couple of hundred of those records and decided that I probably wouldn’t cue them up again, and I threw them out. It wasn’t easy, for they held a solid history of popular rock music from the late 60’s to the late 80’s. Over twenty years of what it was all about, for Bill Huie and the music. Bill died fairly young from complications caused by alcoholism.